University of North Carolina (UNC) School of Medicine scientists report using transcranial alternating current stimulation (tACS) to enhance memory during sleep, laying the groundwork for a new treatment paradigm for neurological and psychiatric disorders. Do sleep spindles cause memory consolidation? The experiment. For years, researchers have recorded electrical brain activity that oscillates or alternates during sleep on an electroencephalogram (EEG) as waves called sleep spindles. And scientists have suspected their involvement in cataloging and storing memories as we sleep. Before going to sleep each night, all participants performed two common memory exercises — associative word-pairing tests and motor sequence tapping tasks, which involved repeatedly finger-tapping a specific sequence. During both study nights, each participant had electrodes placed at specific spots on their scalps. During sleep one of the nights, each person received tACS — an alternating current of weak electricity synchronized with the brain’s natural sleep spindles. During sleep the other night, each person received sham stimulation as placebo. This marks the first time a research group has reported selectively targeting sleep spindles without also increasing other natural electrical brain activity during sleep. This has never been accomplished with tDCS* (transcranial direct current stimulation), the much more popular cousin of tACS in which a constant stream of weak electrical current is applied to the scalp (see Neuroscience researchers caution public about hidden risks of self-administered brain stimulation*). Frohlich said the next step is to try the same type of non-invasive brain stimulation in patients that have known deficits in these spindle activity patterns. It’s a sort of jungle in there, one with unknown species. The researchers say they may target posterior brain regions using faster frequencies (e.g., 15 Hz tACS) to optimally benefit motor memory consolidation, for example, and that maybe they should try synchronization of frontal oscillatory activity. And they want to find out if spindles synchronized across cortical regions are “essential for memory consolidation to occur” or are only spindles localized to brain regions necessary for performing the task? And when it comes to developing neuro-therapeutics, things will get even wilder. Will anomalous spindle patterns need to be reconstructed and reinforced, or will whole new customized patterns be needed? And if so, would this be some kind of reconstruction of a person’s memory (at least, their motor memory, for starters)? and what about dealing with circadian desynchronization and its possible disruptive effects on spindle patterns? And does it makes sense to look at phase patterns, in addition to frequency? And perhaps most interesting to Kurzweilians, could the ability to improve spindle patterns, using machine learning, lead one day to cyborg minds and merged human-machine superintelligence? KurzweilAI will be closely following this fascinating research. The study was funded by the National Institutes of Health, UNC Department of Psychiatry, UNC School of Medicine, and Swiss National Science Foundation. Transient episodes of brain oscillations are a common feature of both the waking and the sleeping brain. Sleep spindles represent a prominent example of a poorly understood transient brain oscillation that is impaired in disorders such as Alzheimer’s disease and schizophrenia. However, the causal role of these bouts of thalamo-cortical oscillations remains unknown. Demonstrating a functional role of sleep spindles in cognitive processes has, so far, been hindered by the lack of a tool to target transient brain oscillations in real time. Here, we show, for the first time, selective enhancement of sleep spindles with non-invasive brain stimulation in humans. 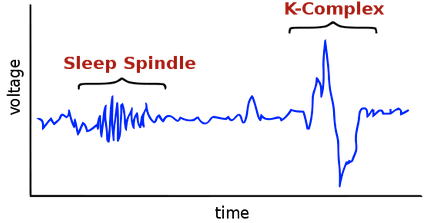 We developed a system that detects sleep spindles in real time and applies oscillatory stimulation. Our stimulation selectively enhanced spindle activity as determined by increased sigma activity after transcranial alternating current stimulation (tACS) application. This targeted modulation caused significant enhancement of motor memory consolidation that correlated with the stimulation-induced change in fast spindle activity. Strikingly, we found a similar correlation between motor memory and spindle characteristics during the sham night for the same spindle frequencies and electrode locations. Therefore, our results directly demonstrate a functional relationship between oscillatory spindle activity and cognition.